He has no name. He cannot speak. The man does not even know where he is, and time is also a stranger to him. For a whole year, the nameless one lies in a coma and practices coming round again. But then he returns to the world, and his senses unexpectedly link up. He can remember everything. An accident, it seems, put him in this situation. He cannot move his body but he is nevertheless conscious of himself – and not only that: he can read both the thoughts and longings of other people. In this higher home, he begins to feel that he will be able to return to life and his body. The friendship of a man and the love of two women make him into a person imbued with hope. 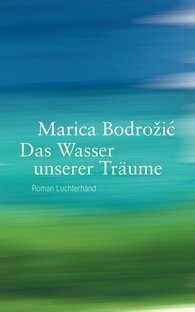 With linguistic brilliance, Marica Bodrožić sets off on a journey to fascinating spiritual landscapes and writes of what remains in life – and what in the end is important. The Water of Our Dreams is the culmination of her poetic trilogy about the love triangle between the painter Arik and the two friends Arjeta and Nadeshda. "One of the most extraordinary, fresh, and original voices of contemporary German-language literature."